WHILE White Helmets boss, Raed Saleh, was addressing sponsors and fans in the British Parliament on November 22, his group’s latest media stunt was being panned by foes and embarrassed friends, alike. The White Helmet Mannequin Challenge video was hastily pulled off the RFS (Revolutionary Forces of Syria Media) site, as social media lit up on the remarkable similarities between the staged production and White Helmets’ supplied footage that has become a staple ingredient of western television news bulletins. In an apology to the BBC – one of the chief purveyors of White Helmets “news” – the organisation said the stunt had not been sanctioned by its leadership and volunteers responsible had been “disciplined”. In a statement, run by the BBC on November 24, the White Helmets acknowledged the involvement of their members. 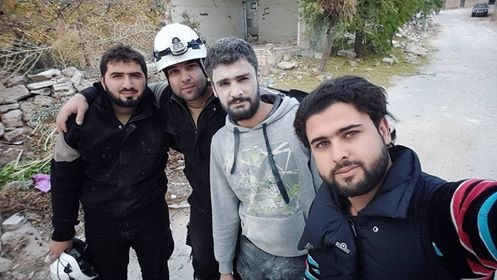 “The video and the related posts were recorded by RFS media with Syria Civil Defence (White Helmets) volunteers, who hoped to create a connection between the horror of Syria and the outside world, using the viral Mannequin Challenge,” the statement read. “This was an error of judgement, and we apologise on behalf of the volunteers involved. The big problem, of course, was that the stunt looked very much like all the other footage the Helmets have been supplying to news outlets around the world – same style, same production values even, is seemed, the same dust and blood. The Helmets are a self-described “civil defence” organisation operating in terrorist-held regions of Syria. They are active in areas controlled by proscribed terrorist organisations affiliated with Al Qaeda and DAESH. Funded by NATO countries, including the US, and largely trained in Turkey, the Helmets supply a steady flow of high production-value “news” footage to western media outlets and an even steadier flow of anti-government propaganda. They are authors of repeated reports that the last hospital in eastern Aleppo has just been destroyed by government/Russian forces. There is every chance you will see one of them on the news tonight. Just how many last hospitals there are, or were, in eastern Aleppo has never been made clear. And, for a non-political, civil defence organisation, they run some odd lines – like advocating foreign military attacks on their country and urging the US to impose a no-fly zone that would allow terrorist organisations to operate more freely. The White Helmets are not, of course, the official Syrian civil defence organisation and nor are they recognised by it. The services of that organisation are widely advertised, and available to Syrian citizens who dial 113. Increasingly, however, that established and internationally-recognised service is being disrupted and denied to Syrians by organisations linked with the White Helmets. The Helmets are not widely available to Syrians in need, and nor are their services advertised to the general public. The official Syrian civil defence organisation was formed in 1953 and is recognised by the International Civil Defence Organisation (ICDO) and the United Nations. The closest the White Helmets have come to that was when the Syrian civil defence organisation link on the ICDO website was hacked so that visitors were redirected to a White Helmet propaganda site. The reason their Mannequin Challenge stunt caused so many raised eyebrows is because of the striking similarities the hammed-up footage bore to news reports the group has been passing off as genuine. This article examines the latest White Helmets tactical balls-up. While the following Cross Talk segment discusses the White Helmets with a group of western journalists, some of whom have actually been to Syria. This entry was posted in syria news, syrian civil war and tagged Aleppo, Cross Talk, DAESH, Leading British, Mannequin Challenge, RFS, syria, US, White Helmet, White Helmets. Bookmark the permalink.